Gifts from the Pirates: "In the quiet moments, the discoveries are made." "In the quiet moments, the discoveries are made." It's been a really odd few weeks for us. With the loss of a well loved family member and an array of negativity around us. Things seemed to be going from bad to worse but then one afternoon the week before last there was a knock at the door and there stood our postie holding an intriguing package. I love seeing a package at the door especially when I'm not expecting anything. It seems that those magical pirates that watch over the boys had been watching over me too. I opened the box to find the one thing I'd been pining over since Seth got his Nintendo 2ds back in November. for the last month or so while Seth has been doing his Physio Ive heard "i wish you could play 3ds games with me" and "when is mommy going to buy you a 3ds?". One afternoon Seth even told me that he was going to work really hard around the house for pocket money so that he could buy me one because, in his words.. "You're the best Stepdad ever". Seth is such a cutie and clearly was desperate for a play mate, so when i picked him up from school that afternoon and told him the news his little eyes lit up. Finally he would no longer play alone. Mrs M has been working on something big over the last two weeks and since we are down to one Macbook due to a recent sippy cup accident, Ive had limited access to the computer. The blog has suffered a little but my gaming has come on a treat. We limit the boys during the day when it comes to gaming. Seth will always want to play during Physio and Opeie will always want to play Super Mario before bed, every quiet chance Ive had when I'm alone the 3ds has gone on and Ive switched off from the rest of the world. It doesn't happen as much as i would like being a stay at home dad but i take full advantage where i can. Prime times for me are waiting in the car for Seth to come out of school or if that little angel of mine drops off while I'm driving home i just pull up outside the house, pop my feet up and play until he wakes up, my console is always close by. Or my favourite time is in the bath, although i do tend to get carried away and lose track of time. 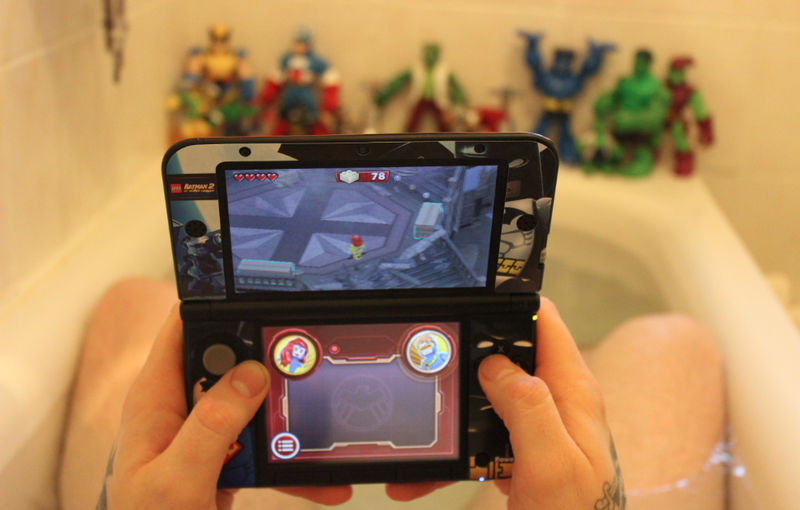 The bath usually needs the water warming up three or four times while I'm in a Nintendo bubble. Having the console has been a great distraction for the boys too, especially when we are waiting around for mommy. Last weekend while Mrs M was in the Opticians we sat down for a three player game of Mario Kart. Its great how the newer consoles can be linked to the older DSi's for multi player action. All this talk of gaming has made me realise i really need a bath, so I'm off for a bit of me time while Ive got the chance. A big thank you to my Nintendo pirates, they've made this hairy gamer very happy. The boys got a 2DS for Christmas at long last as their old DS's are getting pretty bruised and battered now they are years and years old and I was impressed that we can play the DS games and even 3DS games in the 2DS. At least it stopped them nagging us for a 3DS for now. We totally rely on them for long journeys which I think would be so so difficult without the DS/ 2DS to play.